Park West at Grand Hyatt boasts of stylish, soothing interior designs and modern furnishings brings you the contemporary elegance of New York lifestyle. 1 Bedroom with 36 sq.m. 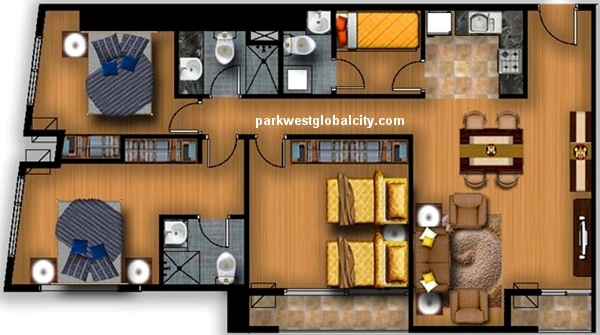 Successful urbanites can live life to the fullest in this 1-bedroom unit with 36 sq.m. Suitable for on-the-go professional, enjoy more privacy and living solo in this well-designed space. 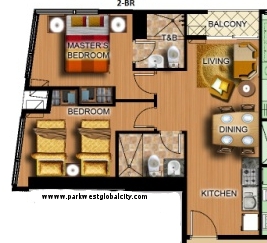 2 Bedroom with 55 sq.m. 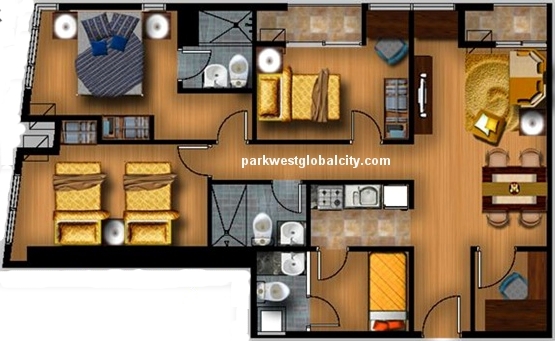 More space and ease of movement awaits you in this 2-bedroom unit with 55 sq.m. Perfect for starter family that enjoys the cosmopolitan vibe of the bustling The Fort. 2 Bedroom with 70 sq.m. The family can always feel at home with this 70 sq.m. 2-bedroom unit. Enjoy the view of Global City from your spacious living room with an access to a wide balcony. 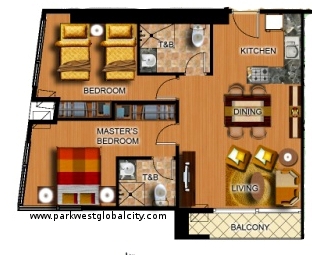 If you need more space for your family, this 3-bedroom with 91 sq.m. is perfect for you. 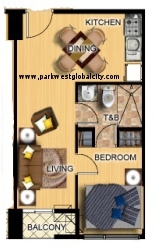 Be proud and celebrate your success with this 3-bedroom unit with 106 sq.m. More freedom of space awaits you at the Bi-level Executive Villas with 157 sq.m. There are also available villas with 102 sq.m. and 104 sq.m. For sample computation, please see Term and Computation and for current promotions and discount, please see Promotion and Discount. For more information about Park West and for inquiries, please see Inquiry. Layouts are architect’s rendering of the featured unit, to serve as a guide to buyers on how to furnish and customize their units. All partitions, finishing, furniture, appliances, and accessories shown are for illustrative purposes only and may not form part of Federal Land’s standard deliverables. The contents are provided in good faith to describe the general idea of the project’s development concept. All plans and information in this website are for identification and reference only. All details are subject to change without prior notice and do not form part of an offer or contract to sell. Picture, logos and images are owned and copyrighted by Federal Land Inc. This is a private website owned and maintained by Evelyn Maliwat. This is not the official website of Federal Land Inc.
Click to subscribe and receive notifications updates on Park West.